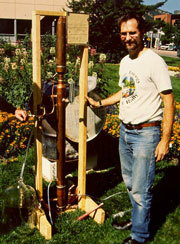 Here is Robert Warren running his still at a public energy fair in Boulder, Colorado. Just behind his hand is a white and black 50 gallon barrel, filled with 40 gallons of beer donated by a local brewery. The garden hose brings cooling water into the automatic temperature valve. The high proof alochol runs out into the glass bottle at the lower left. 160 proof in just over an hour of boiling time! to redesign this most acurate distillation instrument. and Pete Charles played around with the many Mother earth's designs and to make a long story short, they managed to shrinnk the normal 6 to 9 feet of column needed to achieve 180+Proof output in one pass into a neat device called the Charles 803. Mainly by spanning the coils all the way through the reflux and condensation sections. temperature to cause the vapors to pass to the condenser's chimney, containing 160 to 180 Proof alcohol. 3) As the cooling water keeps going DOWN the reflux column, it gradually picks up heat from the very hot vapors REFLUXING their merry way up the column and gently cool the vapors by bringing graduall controlled cooling. flow to maintain perfect equilibrium. never stabilize the smooth flow of energy required. valve of the V47 type. Electricity around distillation at home or near home. that I can be held liable for dumb screw ups one would encounter using my valve. liability waiver written up and legally registered. you get from the natural maximum azeotope IDEAL level of 195 Proof ( or there abouts...)the more energy and fussing about you will get yourself stuck into. Has been runing EXCLUSIVELY on 160 Proof Ethanol for the last 3 summers, and other than readjusting the mixture to slightluy richer, and moving the timing ahead by 6°, it runs well.